Everyone wants to be a jewelry designer these days, and while I think for the person who really wants to design and sell her work, you need some real experience as far as making it, even the novice jewelry lover can come up with some great jewelry design ideas. In fact, many jewelry designers I know start off making jewelry because they can't find what they are looking for, so heck, why not just make it? If you love pearls and haven't been able to find what your are looking for as far as a special pearl jewelry piece, then check into Shecy Pearls option to Design Your Own Pearl Jewelry. You start off giving basic information on the company's on-line form such as the type of jewelry – ring, necklace, bracelets, earrings – and then a price range, and then they provide a box for you to type in details, such as size of the pearls, color, type of metal, that sort of thing. Once you plug all that in, they contact you and go on from there. Of course, first it might be a good idea to check out what they have in stock already. I love this lavendar pearl necklace (pictured above/left). 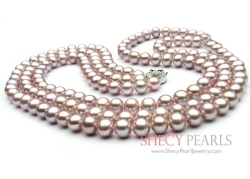 The multi-strand has 8-9mm AAA grade pearls that have a light purple tint to them. Here are a few more pieces just for the heck of it.